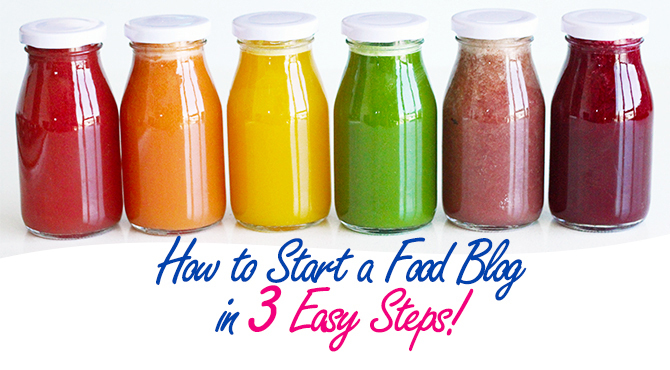 Have you ever wanted to start your very own food blog? Dreamt of having hundreds, thousands, maybe even millions of people gawk at your awesome recipe creations? Well, it’s time to stop procrastinating and start turning your food blog into a reality. And, hey, you wanna know the best part? Starting a Food Blog is Easy! Yes, it really is! No BS. In fact, I’m willing to bet that it’ll take you less than 15 minutes to get your food blog fully up and running. Just follow these 3 easy steps on how to start a food blog and, before you know it, you’ll be on your way to Food Blogging Stardom, tasty recipe creations in tow! 🙂 Hey, if an idiot like me can do it, so can you! Disclaimer: Some links in this post are affiliate links. I earn a commission if you purchase anything through them, at no extra cost to you. We only recommend services I completely trust, based on our first-hand experiences. 3. Make Your Food Blog Gorgeous! A domain name is simply the address you want your food blog to have. Mine is CrazyVeganKitchen.com. Duh! Easy, right? Found an available name? Great! Click on ‘Click Here To Register’ in the box above. You’ll be directed to a page showing different Hosting Plans. You can think of hosting as ‘online real estate’ you’ll need to buy in order to house your food blog. Bluehost is widely recognised as one of the most reliable & affordable hosting providers around. Plus, they offer free domain name registration – a perk not many hosting companies offer! Click ‘Select’ and fill out all the required fields. I personally recommend opting for ‘Domain Privacy Protection’ since it hides your phone number and address from public display. Feel free to skip the other services for now. Blogging sites like Blogger or Tumblr may let you blog for free – but these companies also greatly restrict your opportunities to make money from your food blog. Buying your own domain & hosting plan is the first-step to earning an independent income from blogging! Most popular food bloggers use WordPress as their free blogging software of choice. It’s super easy to use and packed with amazing tools right out of the box. It’s also a breeze to install! To install WordPress, login to Bluehost. Navigate to Hosting > cPanel, and scroll down to ‘Website Builders’. See the WordPress icon? Go ahead and click it, don’t be shy! Hit ‘Start’ for a brand new installation. Select the domain you just purchased and leave the text box empty. Under Show Advanced Options, choose your admin Username, Password, and Email. You will want to write these down for safe keeping. Also, be sure to check ‘Automatically Create A New Database For This Installation’. Hit ‘Install Now’. WordPress will begin installing. YES! Woo hoo! Once installation is complete, you’ll want to take special note of your Admin URL. This is the address you’ll use whenever you want to log into your WordPress food blog. Click on the link. Hooray! Step 2 of starting your own food blog is done, done, done! Piece of (fudgy, extra choc) cake! Now, let’s spruce up your blog’s appearance a little – really make things POP! with a great design that reflects your personality, style, and uniqueness. Installing a WordPress theme will easily help you achieve all of this. There are literally hundreds of free WordPress themes available. You can check them out here. Amazing stuff! Genesis Framework – This is the framework we use at Crazy Vegan Kitchen. You’ll also want to check out other StudioPress Themes such as Foodie Pro, which we’re currently using. Elegant Themes – These themes look fantastic and are used by many famous bloggers. They’re also slightly cheaper than most other premium themes out there. I used to run an old website using Elegant Themes and loved it! And there you have it. Your epic, mega-awesome food blog’s all set up and ready to go, all under 15 minutes. See, we told you starting a food blog is a piece of cake! Welcome to the wild and wacky world of food blogging, brahs. Your hungry audience awaits! Thanks for sharing superb informations. Your site is so cool. I'm impressed by the details that you've on this blog. It reveals how nicely you understand this subject. Bookmarked this website page, will come back for extra articles. You, my pal, ROCK! I found simply the information I already searched everywhere and simply couldn't come across. What a great web site. Thanks a bunch! I have yet to attend any conferences because they are mainly in America and I am in Melbourne at the moment! If you have access and means to attend them, I definitely would suggest mingling and just going there to have a bit of fun - have some on my behalf! Hi there.. first of all lovee the wesbite! how fun it is to find a vegan/vegetarian that is spunky and blunt~ its awesome! i am playing around with the idea of creating a food blog as most of my IG pics are of food, now that i have recently become a vegetarian. So, between reading the comments, and the actual post, when i am creating my wesbite, say its vegetarianforlife.com doesnt my wordpress have to have the same address? therefore making it vegetarianforlife.org? please explain that to me. Also, how did you get the website to grow? did you advertise to people you know? Hi, wonderful stuff. Thanks for sharing. I just have a quick question. I do have a wordpress blog. And my traffic is growing and was wondering of making some money. So would you suggest getting a hosting like for instance the bluehost? Or just signing up with wordpress premium will be good? Because i did some research and wordpress doesn't allow Google Adsense (which pays more apparently).. does bluehost allows that? Hi Selvi, sorry for the late response! I definitely recommend blue host (you can check them out in the links above). Wordpress premium alone inhibits the number of ads you can have on your site which will indirectly cause you to earn a lot less - I suggest getting Bluehost with a Wordpress.Org blog, that's what I'm using! Hello! I'm a big fan of your blog! Among the many posts you have published, I love this article, it's very helpful to me. I’ve shared your awesome post to my friends. A good way to start a blog via Bluehost and start a food blog also.! cheers! Hello. I recently came across your post and appreciate the information provided. I am looking into starting a food blog and would like to know once you create your domain through BlueHost is the process different to install WordPress.org as opposed to the .com process?? I am thinking I would like to go with .org for more freedom in terms of design and ads. I am not sure if I missed this somewhere in your post but wanted to clarify. Thank you in advance for you time. This post is not only great for newbies, but for those of us who are finally ready to start monetizing! This is going to sound like a dumb question, but I've read so many different ways to become self hosted, and which sites to use, that I want to make sure that I'm reading your post right haha :) So once I get my domain through Bluehost, I can just install Wordpress, (without an extra fee?) and be good to go to start creating my site?? (I saw another commenter above mentioning they don't have as much freedom with designing their page so I'm confused). That sounds SO easy compared to what I've read elsewhere!! I've been looking into switching over my site to Bluehost, but always thought you had to pay for Wordpress too! Thanks so much for this!! Great questions Ariel! And thanks for asking them. Believe me, I had to grapple with the same confusion too for the longest time, LOL. You read it completely, 100% right -- once you get your domain through Bluehost, they will give you instructions on how to set up WordPress (which is basically software that resides in your server space). WordPress is COMPLETELY free, and will always be! No extra fees at all because it is included in the Bluehost package. No sudden 'hidden' fees too. The guide I wrote will definitely work to helping you set things up with minimal hassle too. Are you currently on WordPress.com? If you are, there is a difference between WordPress.com and WordPress.org. Think of the first as a site that allows most bloggers to blog for free. The second is a fancy community name for the blogging software itself. So when you shift to Bluehost, they will provide you with the WordPress software for free. :) Just install it and you are good to go, for real! (P.S. You'll definitely need WordPress the software to start monetizing your blog with ads, affiliates, etc. WordPress.com does not allow you to do most of this for legal reasons. Hence the benefits of being self-hosted!) Let me know if I can help you further in any way! I will definitely respond to all your questions as best as I can. :) I intend to write a full length post really soon on how to monetize your food blog. :) Stay tuned! I reckon it'll be done by July for sure! . That's fantastic!!! I've done a little more research and can't wait to get it all squared away! I do not have Wordpress currently; I'm running off of Weebly, which they also offer the option to use through Blue host, but I like the idea of having a variety of plugins and more options design wise for the blog. I did have another quick question as well, when you got your domain and began using Adsense and all, did you also register it as a business? :) Trying to wrap my head around some numbers before I make any purchases! Thanks again A TON!! P.S. I wanted to write to you via email but realized that you didn’t provide a contact address for me to write to. :) So I just left the long response here instead! Hey Alicia, wow, your site is a thing of beauty! Levan is going to love it, I'm gonna make sure he has a look too! It is always a pleasure helping other bloggers out!